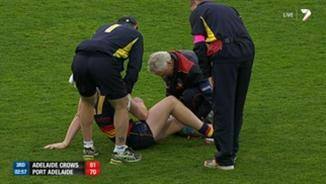 Crows InterchangeTom Lynch off due to an injury. GOAL POWERWingard kicks it into the goal square for Monfries, but he is unable to get a finger onto it and it bounces through. There is a score review and it is a confirmed goal. GOAL POWERThe ball ends up with Butcher who fends off his opponent, runs into the goal square and puts it through for a goal. GOAL CROWSJohnston is awarded a 50m penalty, after his mark was infringed. He kicks from 40m out and he slots through his second goal of the day. We are back for the second term, as the Crows get first use of the ball from the middle. QUARTER TIMEThe Crows take the lead into the first break, leading the Power by seven points. BEHIND CROWSMackay is on the burst, he has a running shot on goal and misses away to the right. Port Adelaide have been struggling to take a strong mark inside the forward line today. Dangerfield has shown no signs of rust after being out for the last two weeks. Adelaide are away through the midfield once again, as they have players free all over the ground. 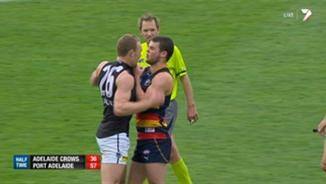 The Crows have started the game off well, showing the Power that ladder positions are irrelevant during a Showdown. GOAL CROWSDouglas finds Dangerfield who marks 45m from goal on a slight angle. He hooks his shot on goal, but it is still enough to go through. BEHIND POWERMonfries soccers one for goal and it is touched on the line for a point. BEHIND CROWSMcKernan finds some space inside 50, he takes the set shot on goal and he misses away to the right. Thompson is having a nightmare couple of minutes, as he is nailed for holding the ball. This game has become a contest now, with the scores level and the tackling pressure has been stepped up a notch. Power InterchangeJackson Trengove off due to the blood rule. Play is held up as Petrenko is coming off the ground with a blood rule at the moment. SUBSTITUTION POWERThe Power have activated their substitution in Colquhoun, after Paul Stewart has come off with a shoulder injury. GOAL POWERAnother clearance and another goal for the Power, as Hartlett threads it through from 60m out. GOAL POWERThe Power with the quick answer, as Schulz grabs the ball, has a quick shot on goal and drills it. Power InterchangePaul Stewart off due to an injury. GOAL CROWSDangerfield marks it 30m from goal, directly in front. He kicks it through for a goal. Welcome back Dangerfield. 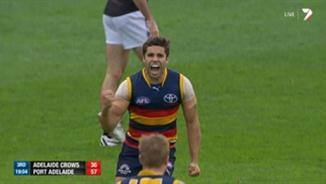 The Crows must defeat their arch rival today, if they want to keep their slim chances alive. Every North Melbourne and Carlton fan will be hoping for the same. GOAL CROWSJohnston comes out and takes the mark 40m from goal on a 45 degree angle. He slots it straight through the middle. Gray with a great kick at goal from the pack, but unfortunately it bounces backwards and the Crows clear it away. The ball is bounced in the middle and we are under way. There are no late changes for either side. The subs for today are Grigg for the Crows and Colquhoun for the Power. Welcome to AAMI Stadium for the Showdown. It's the big one. It's the be all and end all for the Crows. It's Adelaide v Port Adelaide. Welcome to AAMI Stadium for the Adelaide Crows v Port Adelaide Round 19 clash. AN INSPIRED five-goal performance from emerging star Chad Wingard, including a clutch last-minute match-winner, has led Port Adelaide to a four-point Showdown victory over Adelaide. The 19-year-old nailed his fifth goal with 28 seconds left on the clock to seal the win and cap an incredible comeback after the Power trailed by 20 points with 22 minutes played in the final term. 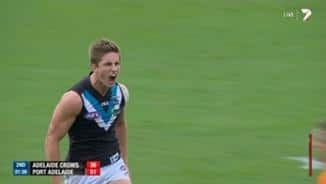 It ended a run of four successive Port goals, which included an incredible off-break bounce from Angus Monfries' snap that cut the margin to two points and set the stage for Wingard to write his name into Showdown legend. It was the first Showdown to be decided by less than a goal in the encounter's 35-game history. Wingard was by far the game's best player and further stamped his reputation as Port's most exciting player since Gavin Wanganeen by taking out his first Showdown Medal. 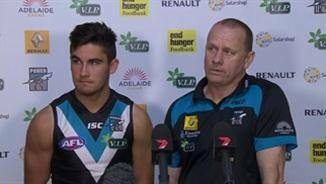 Power coach Ken Hinkley said Wingard was a lock for All Australian selection this year. "He's a special player, he's had an incredible season and there's absolutely no doubt in my mind if not before today he's going to be in the All Australian side surely," Hinkley said. "He's had an amazing year and today was the icing on the cake for him and his year bar none has been first class at this football club. "It just shows his character, he believes in himself, he believes in his teammates and his job was to finish off their great work." Adelaide was best served by Brad Crouch and David Mackay through the midfield, while Patrick Dangerfield and Lewis Johnston kicked four goals apiece. 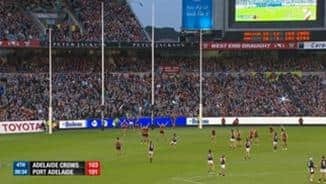 From the opening bounce the pressure was high and despite Matthew Lobbe offering the Power's midfielders first use, the Crows snuck out to an early lead. Jared Petrenko executed a brilliant chase and tackle to catch Paul Stewart holding the ball, but Stewart badly broke his left wrist in the process and was quickly subbed for youngster Sam Colquhoun. 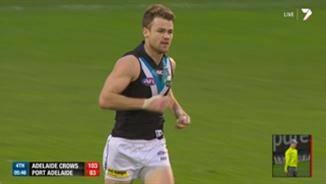 An infringement by Power skipper Travis Boak brought Lewis Johnston within range to nail his second goal early in the second quarter with his renowned goal-kicking skills on full show. But the Power then piled on seven goals to one for the term with Gray and Monfries combining twice to gift each other majors as Port Adelaide led by 21 points at half-time. Young guns Crouch and Wingard were dominating with 17 and 15 first-half possessions respectively while Hamish Hartlett got in on the act too with two brilliant goals. The Crows needed a spark quickly and they got it seconds into the third quarter with Johnston involved in consecutive plays as Petrenko finished on his left before nailing a second in five minutes. 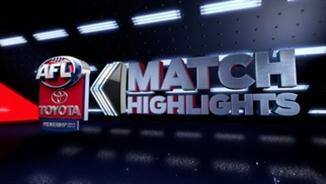 Johnston kicked his third – a massive 70m bomb that bounced through – but it was 19-year-old Mitch Grigg who set AAMI Stadium alight in the third term as Adelaide piled on seven goals for the quarter to lead by two goals at the last change. 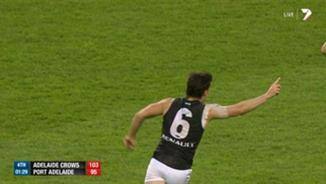 Wingard halved the margin within seconds of the final term's start but the pressure-cooker atmosphere took its toll on both sides as decision-making and skills took a downward turn. Colquhoun closed the gap to a point before three straight goals to Adelaide, capped by Grigg's clever pass to Henderson for a major, gave the Crows what appeared to be a match-winning lead. However, the Power weren't done yet. The win puts eighth-placed Port Adelaide two games clear of Carlton with four games remaining, while the loss finally puts an end to Adelaide's admittedly flimsy hopes of returning to the finals. The Crows are now 13th, four games and percentage out of the top eight. 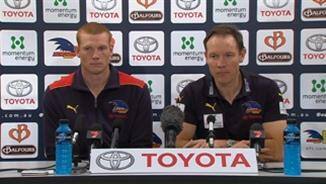 Crows coach Brenton Sanderson said that while his side's shot at playing finals was now over, he wouldn't pick players just to see what they could offer the club in 2014. "We lose and we're out, it seems," he said. "We've still got four games though to finish the year off. "We'll still keep picking our best 22 each week ... regardless of experience or age. "We'll do our very best to fight this season out ... until that final siren in the last quarter of the last game of the year."